AMD: Socket FM2/ FM1/ AM3/ AM2 / AM2. The manufacturer seals on the item must still be intact. These fees are non-negotiable. This includes California residents. California Law. Back To Top. Heatpipe: 80 mm. AMD® AM4 / AM3 / AM3 / AM2 / AM2 / FM2 / FM2 / FM1 socket. RR-212E-20PK-R2: 4719512035054. EAN Code RR-212E-20PK-R1: 4719512032701. Fan Weight 104g (0.23 lb). 2.28W (EU Version). Power Consumption 2.64W. Trending at $34.99eBay determines this price through a machine learned model of the product's sale prices within the last 90 days. Approximate height from top of CPU to the top of the cooler is 6 3/8". 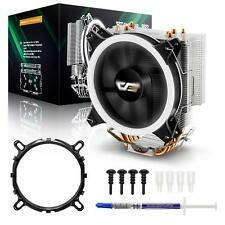 This cooler should be installed on the motherboard before the motherboard is installed into the PC case. 600 – 2,000 RPM (PWM) ± 10%. CPU Socket. All-in-one Mounting Solution, Thermal Grease, 120mm PWM Fan, and 2 Fan Mounting Brackets. 120 x 120 x 25 mm (4.7 x 4.7 x 1 in). 120 x 79.7 x 158.5 mm (4.7 x 3.1 x 6.2 in). AMD Athlon, Opteron, Phenom, FX : Socket 754 939 940 AM2 AM2 AM3 AM3 . 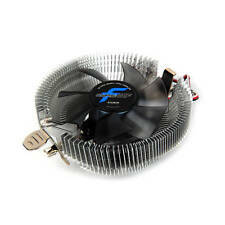 NEW GENUINE ADAPTEC SOLID COPPER HEAT SINK COOLING FAN. 1 (ONE) ADAPTEC SOLID COPPER HEAT SINK WITH COOLING FAN. Copper 1100 Base. AMD Silent Wraith Cooler without LED light. For AMD Socket FM2 FM1 AM3 AM2 PC Components. 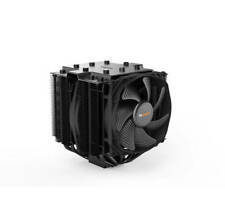 AMD ORIGINAL COOLER (Featuring near-silent 39dbA operation) Copper Base/Alum Heat Sink & 2.75" Fan w/Heatpipes & 4-Pin Connector Support Socket FM2/FM1/AM3/AM2 /AM2/1207/939/940/754 Support up to 125W CPU. Mfr Part Number: BK021. Virtually inaudible Silent Wings 135mm PWM fan. Model: Silent Wings 135mm PWM. Six high-performance copper heat pipes. Brushed aluminum top cover with diamond cut finish. Material: Copper Base / Aluminum Fins. AMD OEM CPU cooler compatible with sockets AM3 , AM3, AM2, AM2 , 940, 939, 754, FM1, FM2, FM2 and F (1207). Refer to the pictures to see how the item looks like. I’m a reasonable person & will try to work with you to resolve whatever issue you are having with a particular item. Lightly Used CoolerMaster Master Air Maker 8 CPU Cooler. This cooler was never abused, never stress-tested, and never used in a crypto-mining rig. I take good care of my stuff, this item reflects that. 555, 560, 565, 570, B53, B54 Phenom II X4 Series: 900e, 905e, 910e, 910, 925, 945, B93, B95, 805, 810, 820 & 840. Used for like a year - switching to an AIO. F140HP Series. Phanteks' patented P.A.T.S technology. MVB II enhances thermal convection inside the case. Six 6mm C-Type nickel plated heat-pipes with slim aluminum stacked fins. Direct airflow to CPU. Cryorog H5 CPU cooler for AMD AM4 Only - Condition is Used. Supports AM4. This is for AMD only. Heatsink Specification. Ran for less than 6 months on my Ryzen 1500X before I decided to upgrade to custom loop water cooling. And we will do our best to make you satisfied. provided before purchasing. It is for an AMD processor and it is a 3 pin connector. Details all described in ad specifications. Supports AMD Socket AM2 AM2 AM3 AM3 FM2 FM2 . High Performance Copper Core Thick Heat Sink. 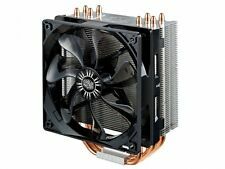 Scythe Kozuti Low Profile CPU Cooler AMD ONLY . Fits all AMD sockets up to AM3 AMD ONLY . Low profile Compact fan developed for use in Multimedia PC (HTPC). With the installation of a 80 x 80 x 10mm sized PWM fan positioned below the fins, the total height of the cooler has been reduced significantly Overall Dimensions: 110 x 103 x 40 mm / 4.33 x 4.06 x1.58 in Weight Including Fan: 250 g / 8.82 oz Accessory: Installation Guide, Thermal Grease Baseplate-Material: Nickel-plated copper 38 x 38 mm Fan-Spezifications Model Name: PWM4-pin fan Model No. : SY8010SL12M-P Fan Dimensions: 80 x 80 x 10 mm / 3.15 x 3.15 x 0.39 in Fan Speed: 800 (±30%) - 3300upm (±10%) - regulated by PWM Air Flow: 6.0CFM ～ 24.82CFM Noise Level: 8.2 ～ 32.5dBA Input Power: 2,4 W Input Current: 0,20 A Guaranteed to as described or your money back. Massive Noctua NH-D14 Premium CPU Cooler with Dual Fans, NF-P14 & NF-P12. Air cooled CPU cooler with water cooling like power. Runs quiet. Check Noctua's website for detailed specifications. AMD 754/939/940 AM2/AM2 /AM3/FM1/FM2. Available CPU model Material: Aluminum. Power Usage: 0.18A. Life: 30.000 hours. 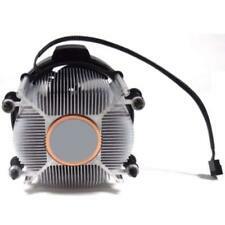 PURE ROCK SLIM (BK008) Compact Heatsink/CPU Cooler. PWM variable speed operation to help balance cooling and quietness. A high 120W TDP cooling efficiency. Silence-optimized, seven blade 92mm be quiet! Phenom II X4 Series: 900e, 905e, 910e, 910, 925, 945, B93, B95, 805, 810, 820 & 840. 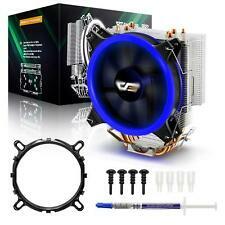 One New Genuine AMD Phenom II X4 Aluminum Heatsink & Fan. Phenom II X2 Series Model No: 545, 550. 555, 560, 565, 570, B53, B54. This is both the active and 1U passive heatsink for these processors. The fan may be removed for use in a 1U chassis. This FAN may be used for Quad-Core CPUs that are 80W or lower, and Dual-Core CPUs that are 65W or lower (E54xx, L54xx, E53xx, L53xx, E52xx, L52xx, and all 51xx except 5160 b-step). Socket AMD 940 AM2 AM2 AM3 AM3 . Description: 100% Brand new and high quality 2.75'' DC Brushless fan 4-pin power connector (length: Approx. 225mm/8.86'') Dimensions:Approx. 50mm x 70mm x 70mm/1.97'' x 2.75'' x 2.75'' (H x W x D) Excellent cooling performance to keep your Socket processor safe and cool Supports Socket FM1/AM3 /AM3/AM2 /AM2/1207/940/939/754 CPUs up to 100W TDP (Thermal Design Power) Package Included: 1 X HeatSink & CPU Cooling Cooler Fan Brand Unbranded/Generic UPC Does not apply MPN Does Not Apply. Condition is Used. Works on AMD AM4 as well. Still a lot left. Extra CPU Cooling Fan Socket Base Dock Kits For AMD 940 AM2 AM2 AM3 AM3 . Socket AMD 940 AM2 AM2 AM3 AM3 . CPU heatsink fan 1 Bracket 1 Screws 4. Core 2 Duo Phenom X4/X3. Fan size: 80 80 25mm. Fan speed: 2200±10% RPM. Core i7/i5/i3 FX X8/X6/X4. Core 2 Quad Phenom II X6/X4/X3/X2. Working Life: 30000 hours Application for. Cool LED Halo lighting design, simple mounting system is very easy to install but yet strong enough to withstand abuse from transportation(no need reinstall the motherboard). GOLDEN FIELD Lighting Ray CPU Cooler.